Meen peera is a popular fish recipe of kerala. Today, I am using sardines to make this dish. 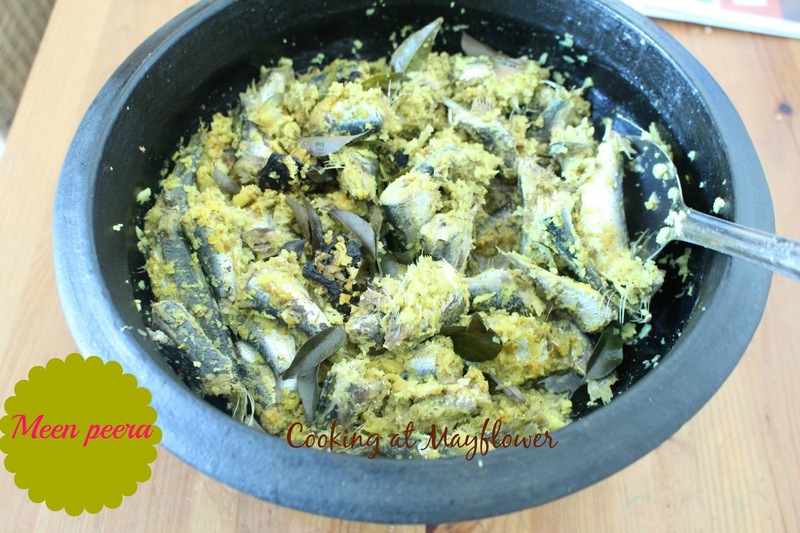 The main ingredients required for making meen peera are sardines, grated coconut, green chillies, onions and kudampuli. This goes well with rice. Clean sardines well using salt and water. If you don't know how to clean sardines, have a look at this video. Cut fish into 2 pieces. Keep aside. Soak gambooge/kudampuli in 1/4 cup of water. Using a mortar and pestle, crush shallots, green chilies, ginger, garlic, grated coconut, turmeric powder, and chili powder. Set this mixture aside. If you don't have a mortar and pestle, you can use mixer or blender for this purpose. Make sure to give only 2 pulses to crush shallots, green chilies, ginger, garlic, grated coconut, turmeric powder, and chili powder. In an earthen pot, add sardines, crushed mixture, salt, curry leaves, and gambooge along with water in which it is soaked. Mix every thing with your hands. Add 1 to 1/2 cups of water. Now place this on a flame and cook. Close with a lid and allow it to cook. When the curry comes to a boil, open the lid, give a nice swirl to the earthern pot (don't use spoon to mix). Now reduce the flame and cook. When the water is little bit dried out (gravy thickens), you can see the masala is well coated on the fish. Add oil and curry leaves. Give a nice swirl of the earthern pot as shown in the video. Reduce the flame and cook for 2 more minutes. Switch off the flame. Serve hot with rice. Pictured - Rice with Coconut rasam / Thengapaal rasam, Carrot poriyal, Chilli pappad and mango pickle. Carrot poriyal makes a healthy salad or a humble side dish that goes well with rice. 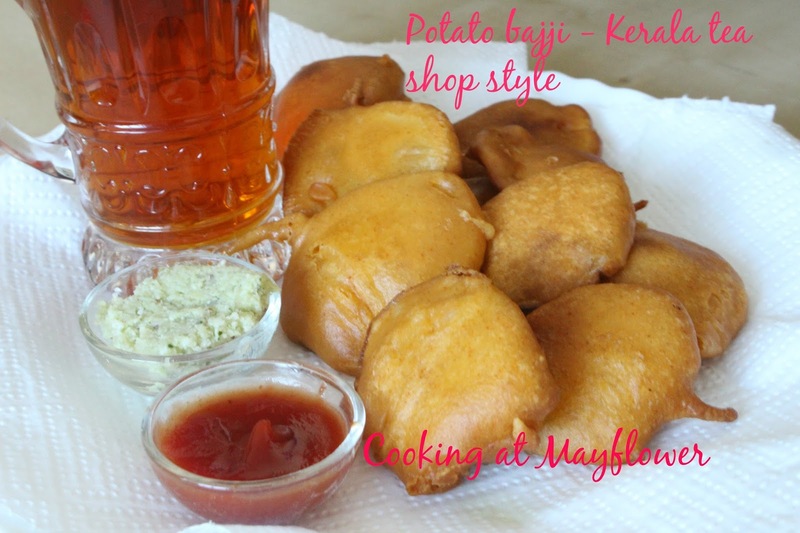 You can make amazing variations of poriyal with vegetables like beans, beetroot, and cabbage. Heat oil in a pan. Add mustard seeds and urad dal, Let it splutter. Now add curry leaves, dry red chillies and green chillies. Add chopped onion and saute for five minutes. Add carrots, Mix well. Now lower the heat and close the lid. Let it cook on low heat. When it is cooked, add grated coconut and salt. Serve hot. Soak paneer in hot water for sometime. This helps to soften the paneer. Remove the water and crumble paneer with your hand. Keep this aside. Heat oil in a nonstick pan. Allow cumin seeds to crackle. Add garlic, ginger and green chilli. Mix. Now add onion. When onion starts to change color, add tomato. Saute well. Add chili powder, turmeric powder, and coriander powder. Saute for a minute. Now add salt. Add capsicum and paneer. Saute well. When everything is blended well, paneer is coated with masala, switch off the flame. To assemble sandwich, place sandwich filling on top of a bread slice. Cover the filling with another slice of bread. Spread butter on top of the bread slice. Place the bread slice on to a sandwich maker with buttered part down. Now spread some butter on top of the other slice. Cook till it get the grill marks. Paneer bhurji sandwich is ready. Serve hot with a cup of chai, coffee, or drink of your choice. If you don't have a grill pan or sandwich maker, you can use dosa pan or tawa and have the bread toasted. 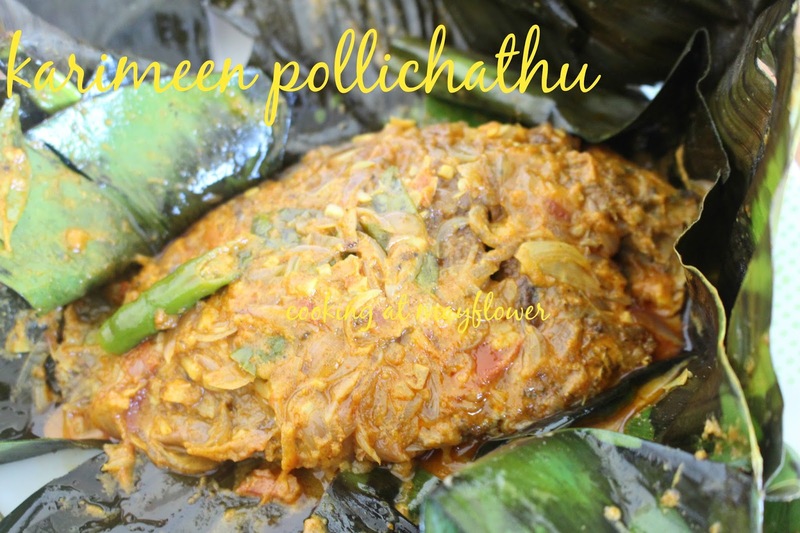 Fish cooked in banana leaf is famous in hotel, houseboat, and toddy shop/kallushap menu. It is a must try for those visiting backwaters of Kerala, not to forget the houseboats. Mostly, a fish called Karimeen, which is caught in backwaters are used to make karimeen pollichathu. 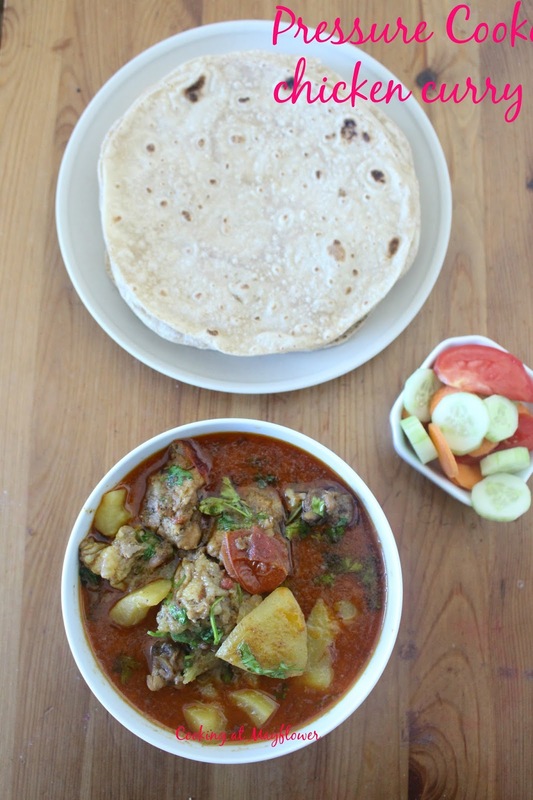 This dish is equally enjoyed by locals and visitors. Banana leaf used in cooking gives it a distinctive flavor. Serve it with some onions, tomatoes, carrots, and lemon wedges. So on your next trip to Kerala, don't miss a trip to backwaters and don't forget to eat Karimeen Pollichathu, a Kuttanadan specialty. Clean the fish and make slits on both sides. Firstly, you have to marinate fish. Secondly, you have to make masala gravy. Let's start by marinating fish. For this, soak pepper powder, chili powder, turmeric powder, lime juice, and salt in small amounts of water to make a smooth paste. Apply the smooth paste on both sides of fish including the belly part. Keep it marinated for 1/2 hour. After ½ hour, heat coconut oil in a pan. Fry fish on both sides. Don't deep fry the fish, just shallow frying is enough. Keep this aside. In the same pan with remaining oil, let's prepare masala gravy for karimeen pollichathu. You can add more oil, if you feel the oil is less to cook the gravy. To the already hot pan, add shallots, green chili, and curry leaves. Saute. Now add garlic and ginger. Saute till the shallots turn light brown in color. When shallots turn light brown in color, add tomato. Saute well till tomato is cooked. Now add coriander powder, chili powder, turmeric powder, and pepper powder. Lower the flame. Saute till the raw smell of masala leaves. Now sauteed masala mixture is ready. Add salt. Mix well. Taste check for salt and add salt only if required. Add thick coconut milk to the mixture. Mix well. Pass heat through the coconut milk, but don't boil it. When coconut milk is heat through, add fried fish. Allow the gravy to be thickened and well blended with the fish. When the fish is well coated with the masala gravy, switch off the stove. Set aside. Lastly, we need to prepare banana leaf for the recipe. Cut banana leaf as required. Switch on the stove. Allow the leaf to wilt by placing both sides of leaf on flame. This helps to soften the banana leaf, which indeed helps with proper sealing of masala gravy to the fish when it is wrapped. Don't ever wrap the fish in banana leaf straight without wilting it. This makes the leaf to tear easily and the gravy will be leaking from the leaf. So wilt the banana leaf before wrapping the fish to avoid the leaf from getting torn and leaking gravy. Grease the wilted banana leaf with coconut oil. Place the fish in the middle of the wilted leaf along with the thick gravy. Add some more masala on top of the fish before folding the leaf. Now fold the leaf in four and tie the banana leaf. You can use thread or banana leaf fibers to help tie the leaf. Wrap the remaining fishes in banana leaf. Place the wrapped fish on to a hot pan. Cook the wrap on both sides. Cook until the leaves look discolored and a nice aroma wafts through the air. Now transfer the fish cooked in banana leaf to a plate. Cut the string to unwrap the banana leaf. You will experience a nice aroma coming from coconut milk and shallots cooked in banana leaf. Clean the banana stem and cut it into small pieces. Grind 1o cloves of garlic and 1 piece of ginger to a fine paste. Set aside. Chop the remaining garlic and ginger. Set this aside. Heat oil in a pan. Splutter mustard seeds. Add chopped garlic and ginger. When it turns color, add banana stem pieces and ground ginger garlic paste. Stir well. Allow to water to dry out. When the water is almost dried out, add chili powder, turmeric powder, fenugreek powder, asafoetida powder, curry leaves, and salt. Stir well. Lower the flame, close the pan with a lid, and cook for 2 minutes. After 2 minutes, open the lid and switch off the stove. Leave this to cool down. When it is slightly warm, but not cold, add vinegar and mix. This pickle can be served instantly. In a blender, add thick yogurt. Blend this. Add water to blended thick yogurt. Set this aside. Grind grated coconut, green chilies, cumin seeds and turmeric powder to a smooth paste. In yogurt-water mixture, add salt. Add smooth paste. Mix well. If it is too thick, add water as required. Put this on stovetop on low heat. Stir continuously. When it is warm through and little bit frothy (but not boiling), switch off the stove. Heat oil in a pan, splutter mustard seeds. Add fenugreek seeds, then dry red chilies, and curry leaves. Pour this over the curry. Moru Kachiyathu goes well with rice, beef pickle, beef fry, sardine fry, Kaya Achinga Mezhukkupuratti, meen mulaku curry. Thenga varutharacha kozhi curry / chicken curry in roasted coconut gravy is a traditional chicken recipe from Kerala. 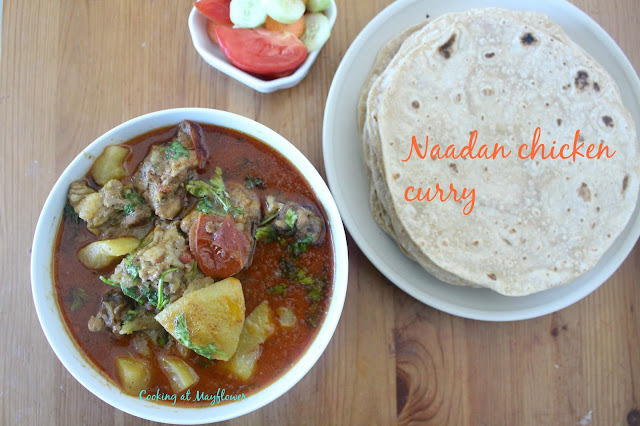 This chicken curry goes well with appam, ghee rice, idiyappam, puttu, etc. Clean and cut chicken into medium pieces. Heat 4 tsp of oil in a pan. Now roast grated coconut, dry red chilies, coriander seeds, garlic, cinnamon, cloves, cardamom, peppercorns, and fennel seeds till it turns golden brown in color. Allow them to cool. Grind it to a smooth paste. Set this aside. Heat 3 tbsp of oil in a pan. Saute onion, ginger, green chilies, and curry leaves. When onion turns light brown in color, add ground masala and sauté well. Now add chicken pieces, salt, little water, and stir well. Cook for 25-30 minutes. 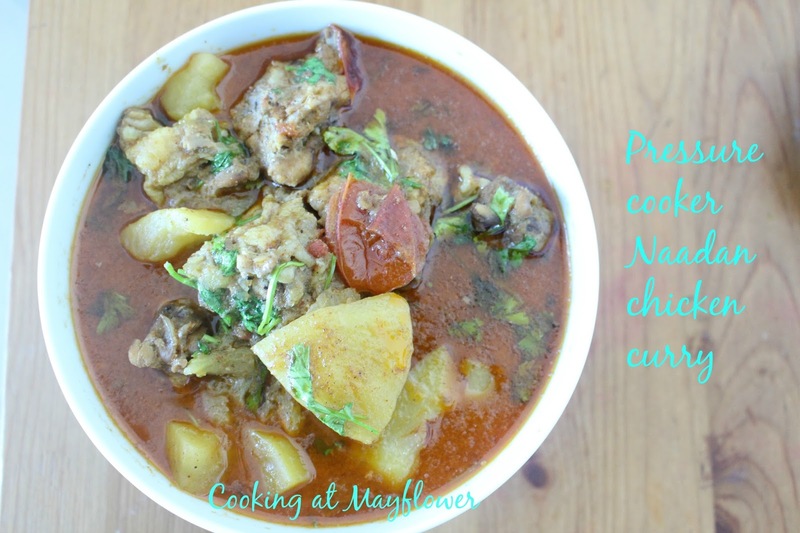 When the chicken is cooked and gravy is thickened, switch off the stove. Heat 2 tbsp of oil in a pan. Allow mustard seeds to splutter. Saute pearl onions, dry red chilies, and curry leaves. When pearl onions turn red, pour this over curry. Serve hot with appam, ghee rice, idiyappam, puttu, etc. Grind coconut and cumin seeds (Give one or two pulse in the mixer). Don't turn it into a paste. Set aside. Heat oil in a pan. Allow mustard seeds to crackle. Add dry red chilies , urad dal and curry leaves. Saute nicely. When urad dal turns light brown in color, add achinga, chili powder and turmeric powder. Mix well. Now add ground coconut cumin mixture. Cook in slow fire with the lid closed till it is done. Open the lid and stir. Sprinkle some water if needed for cooking beans. 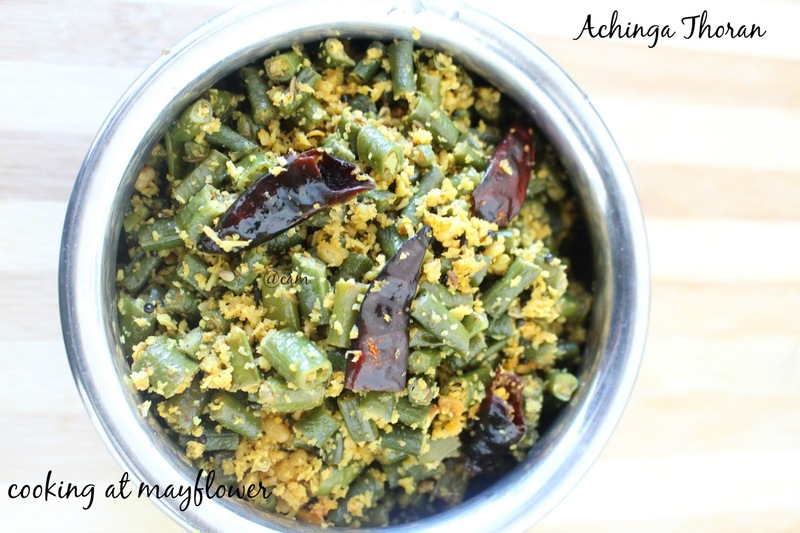 Now achinga thoran is ready to be served with warm rice. Peel the potatoes using a vegetable peeler. Cut potatoes in thin rounds. Care should be taken to cut potato into thin pieces. Otherwise, it will take some time to cook the potatoes.Soak the potatoes in water. Wipe out the excess water using kitchen tissue. 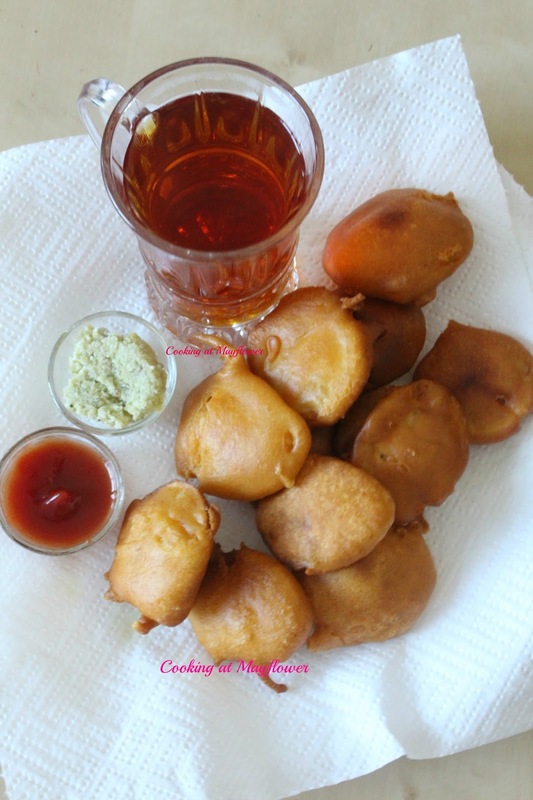 Make a semi-thick batter by mixing gram flour, rice powder, chili powder, salt, asafoetida, baking soda, and oil. Add water little by little to make a semi-thick batter. The batter should be lump free. The batter should not be too thin nor thick. Batter should be of consistency as shown. If the batter is too thin, the coating won't stick to potatoes. If the batter is too thick, you will get fritters, which are very hard. Potato won't be cooked inside. Heat oil in a pan. Dip the potatoes in batter and fry till crispy and light brown. Transfer the fritters on to a plate lined with kitchen tissue. Serve hot with tomato sauce or chammanthi.